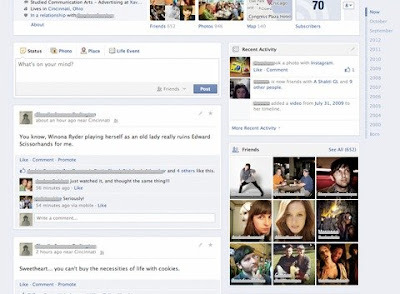 Facebook is testing a redesign of its Timeline feature that could make reading old posts slightly easier. The Menlo Park-based company confirmed that it is testing an experimental version of the redesign on a small number of users. The experimental design was discovered by Inside Facebook. It is similar to older designs Facebook used when its members had "Walls," in which status updates showed up in a linear fashion rather than zigzaging from left to right as they do now with the Timeline. In the test, the Timeline's left column is wider while the right-hand column becomes more narrow. That column is only used to show modules for items such as "Friends," "Places" or "Recent Activity," and once it runs out of modules to show, it simply becomes blank, according to the Inside Facebook. However, the test redesign retains the "years" and "months" feature of the Timeline that lets users navigate through their old posts. The social network did not say if this will one day become the standard for all user profiles.